The building block, which includes the rule of law and opening, on Monday, the accession of 153 deputies signed "live and direct and not through the head of the bloc," noting that it is waiting to mandate the formation of the government. "As a response to the suffering of the people and to meet the requirements and within the Constitution, we have launched the Building Alliance because we are moving towards a constructive phase after the demise of the dictatorship. We started with a bloc of 153 deputies signed by the neighborhood," said Ahmed al-Asadi, a Fatah spokesman affiliated with the alliance. Directly and not through the signature of the head of the block, was presented to the President of the age and includes the conquest and the law and 21 of the victory and 23 of the forces and 9 of the national will and competencies and Salahuddin identity and Shabak and Turkmen and wait for our mandate to form a government. "Our doors will remain open to those who believe that their presence is necessary for the benefit of Iraq , and who wants to object between us and the law," he said. "We promised to be a national bloc, which we have achieved and achieved." 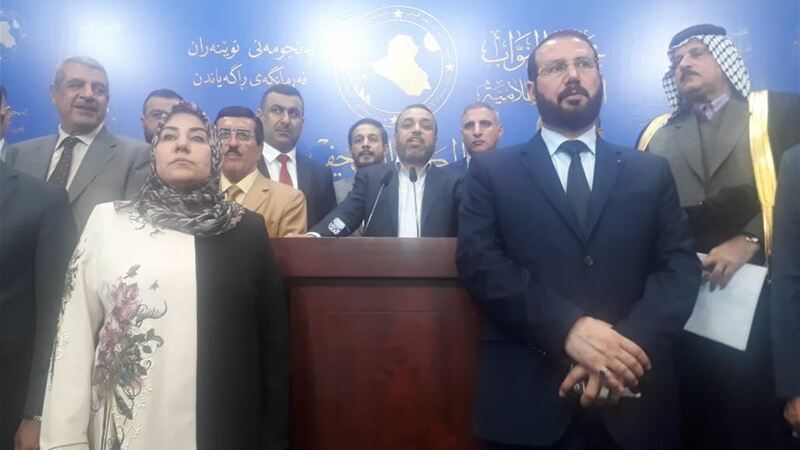 The bloc of reform and reconstruction, which includes the alliances of Sawsan and victory, patriotism and wisdom, on Monday, it is the largest parliamentary bloc, noting the inclusion of more than 180 deputies.